I've stamped my original artwork into sterling silver, using a stamping tool I made myself. It measures approximately 1/2" in diameter (14mm) and has a matte finish. The sterling silver chain is oxidized and is very sturdy. You have your choice of 6.5", 7.5" or 8.5" overall length. To determine the size you should get, measure your wrist with a strip of paper or a piece of string at the spot you'd like to wear it, and for a snug fit add 1/4" to 1/2", for a looser fit add 3/4" to 1". If you need a different length let me know, I can make it however you'd like.This comes in a recycled gift box tied with a raffia ribbon, ready for giving. As pictured, and better! 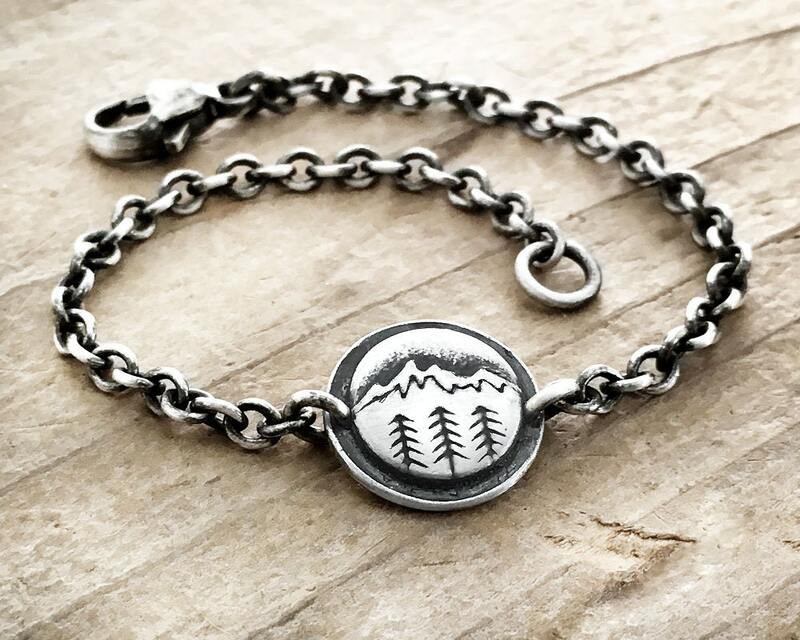 Simple chain bracelet raises the bar with the detailed mountain and trees carved details on the disc! Has wt but not heavy. Arrived quickly and well packed. Would buy again.